I took a few tours around different parts of large area of flat ecoton and around system of 30hectares of lakes in basin of the river Morava in territory Otrokovice (Zlin) – Kunovice (Uherské Hradiště) as I was announced by student of Medical University Miroslav Veselý who sent me an e-mail with information about a big spider and picture of the spider. Locations I have watched have very poor vegetation (…..) are characterized by wide plain with thin grass cover of stroke character. Locality in ravine contains set of lakes and artificially created lagoons, which has been made within 20 years , when the landscape was changed for purpose of digging chippings. There was grown corn in the past. Distance among localities is approximately 5 km. They are spreaded beside reef of The Bata channel with decreasing density in 200 metres length.All area of stroke ecoton with appearance of population of all evolutionary stages is another example of variety of biotops which Lycosa singoriensis can colonize. After estate of relict study I suppose this is the the most numerous colony ever observed in our area. Colony beside the river Morava is concentrated on souteastern oriented reefs and on drifted dried reefs of former river basin where the colony settles also empty rodent burrows. 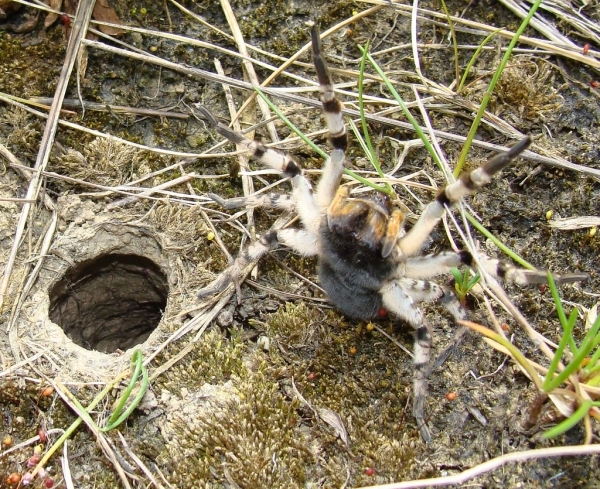 Spider is building burrows which can be 20 cm deep and they are ended with a room. I suppose , following my artificial simulation, females can colonize more burrows. The fact that around main burrow are 2-3 empty ones (and tose can be connected by a corridor) confirmed me in my idea. (Females builds several of such a housings in captivity and they move from one to the others during the night ).Young ones occures on wet edges of this system of burrows ( I have not spotted them anywhere else ).